Bellingham Politics and Economics: The "Obama Diff": Can 2014 turnout match 2012 turnout? The "Obama Diff": Can 2014 turnout match 2012 turnout? 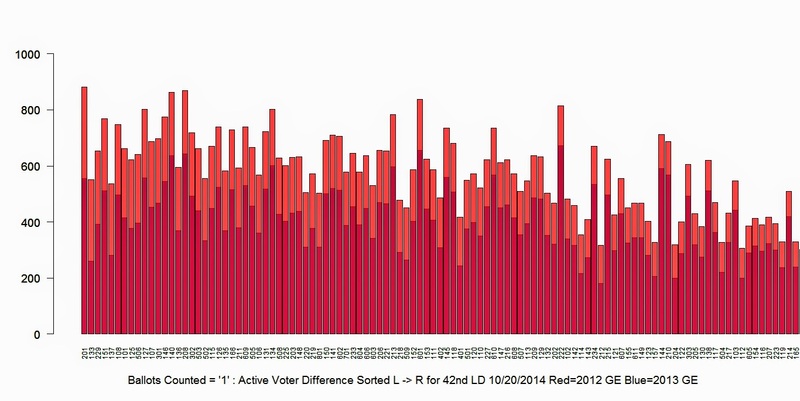 Active Voters 10/20/2014 : Light Red extensions are the per precinct difference between turnout of 2012 GE vs. 2013 GE. It's almost certain that most of the difference between the red and blue in the chart above will vote Democrat. However, those 42nd LD voters elected Cantwell and Obama in 2012 , but not McClendon and Krough. So how will they turn out for Monjure, Sidhu, Fleetwood in 2014? I594: Useful Gun Control or Capitalist Plot? ARE YOU ACTIVE? TODAY IS THE LAST DAY TO UPDATE! !